Nothing elicits mock pity at cocktail parties faster than when I complain, “Food writing is a really hard job.” Until the head-on assault of the Food Network a decade ago, food writing made even soft journalism, such as fashion and gardening, look butch. But average Americans now know their chefs and food writers like they know the members of their favorite rock bands or sports teams. The best dish at the dinner table these days is usually the fight that breaks out over the latest restaurant review. 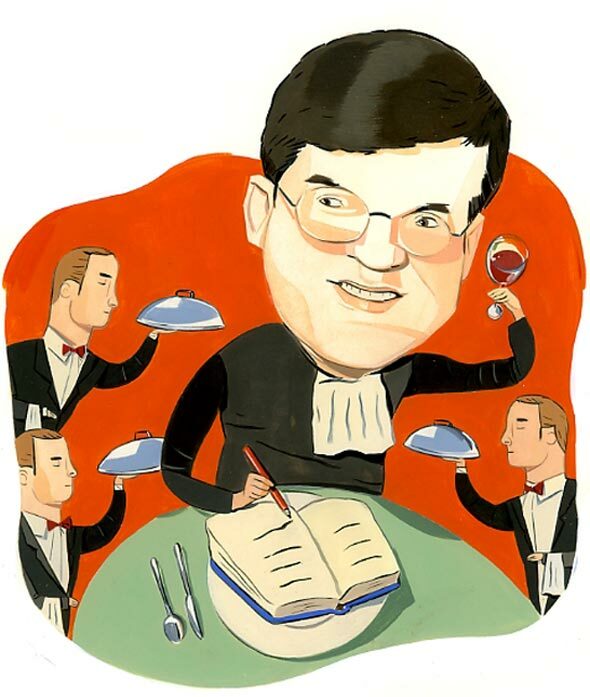 Nonetheless, despite the boost up the food chain, so to speak, I still maintain being a “hired belly,” as James Villas refers to our kind in Between Bites: Memoirs of a Hungry Hedonist, should come with hazard pay. Yes, all of my jealous friends are partly right; I have been invited to my fair share of ultra-chic restaurants. But for every Daniel Boulud and Alain Ducasse, there are dozens upon dozens of chefs, cooks, and desperately clueless people wielding spatulas who think their creations should be adored by the newly ensconced dining class. Needless to say, acid indigestion is my constant companion. “It’s all in the name of education,” I gamely tell myself as I walk into yet another bakery searching for the elusive ultimate chocolate-chip cookie or haul myself into one more restaurant in hope of finding paradigmatic braised short ribs to be fodder for my next column. Another reason for ranking food writing right up there with coal mining and small-plane aviation is that few other jobs pose such a peril to your health. Every day that I go to work is one day farther away from being able to wear flat-front khakis. Many food writers I know stuff their freezers to bursting with Lean Cuisines for those times when they aren’t recipe testing or restaurant hopping. I’ve adopted that plan, along with the idea—if rarely the practice—of afternoon walks. But when deadlines loom, I’m parked in my chair for the better part of the day. And while I won’t divulge how much weight I’ve gained, let’s just say I’ve moved several suit sizes to the right on the clothes rack at Brooks Brothers. Although most of my friends look at me with thinly veiled contempt when I say it, it’s still an immutable truth: Travel food writing is the hardest of all. How can being paid to eat in a fabulous foreign city and stay at a cushy five-star hotel be hard? they glare. Put yourself in my shoes, I suggest. There you are in, say, Siena, and your job is to write an article for a national food magazine. You’re armed with a list of restaurant recommendations given to you by the culinista underground—a group made up of food writers, online foodies, and your neighbor’s cleaning lady, who happened to grow up in the city in question. And to top if off, someone else is picking up the tab. This should be a cakewalk, you brag. You’ll knock off the restaurants in two days and have the rest of the time to sightsee. You visit the first place, a small, overpriced ristorante now overrun with tourists, where you pay for the spectacular view of the Tuscan hills, certainly not the food. So you try the second place. The dainty, family-run trattoria wedged between a cobbler and a tinsmith is not so twee as to be annoying, but not particularly worth writing home about, either. And so it goes; most of the restaurants get crossed off the list for sundry reasons. Finally you have only two days left, and no story. Niente. You accost the concierge at your hotel, hoping he has a special place that would be a perfect hook. You speak in a flurry of pidgin Italian, broken French, and cobbled-together Spanish as you try charming favorite spots out of the locals. Your guidebooks, filled with carefully annotated Post-It Notes of all the art you planned to take in, lie on the bed, neglected. Your food writing career looks like it’s about to tank. Out of desperation, you start eating two lunches and two dinners a day. One night you find yourself facing a 15-course paean to hill-town cooking that finally gives you the central theme to your piece. Unfortunately, you pick at your food because not 30 minutes earlier you were done in by a marvelous but mammoth seven-course meal. Back home you avoid the scale for a week, and when you finally check, you’re still up 11 pounds. Of course, this same group of my friends without pity is the first to treat me like a walking food writing encyclopedia or a human Zagat Survey. I was at dinner recently with a fellow food writer from Geneva who put several questions to me: Why are french fries called French when they originated in Belgium? Why is the main course in America called an entrée when that’s the French word for starter? Why do Americans use the term maître d’ by itself when you have to be a maître of something, such as a maître d’hôtel? Suddenly I was mentally hopscotching from Antwerp to France to the dining rooms at the Plaza Athénée, when all I wanted to do was enjoy my plate of tasty barbecued ribs. But all the badgering has offered up one benefit: I’ve found a failsafe way of putting the skids to the inquisition when it gets out of hand. I simply ask, “Didn’t you read my last article? It was all in there.” An awkward pause and a wan smile usually follow, affording me enough respite to make it through dinner uninterrupted. Great ‘insiders’ tale! I’m still not dishing much sympathy your way; you travel & you eat out, two things you & I like to do. Only you make a living at it. Me? Not so much. Then there’s the writing…which you excel at. Don’t stop. ps. yes, cats do have seizures. It’s pretty sad to live with. Sheer brilliance—sheer brilliance that I plan to put to use soon! Although I’m a local food writer, I concur with all that you wrote! But when I get frustrated (or feeling fat and full and fried chicken is on my dinner docket), I simply harken to the days when I covered local school boards and know that I have the best beat at the paper. Lorraine, hmmm. School boards, fried chicken. School boards, fried chicken. No contest. Hahahahahahah, “didn’t you read my last article?” All the extra calories in all the extra meals that it takes to get a great article out there hasn’t slowed your synapses if you can throw them with a witty question halting come back like that. I think writing in any form has to be hard, especially the ones requiring research and judgement of the items researched. You definitely fall into that category. Lauralee, no but a few arteries are clogged though! Once again you prove that wit is still on the menu, even at the most remote of the “best place to eat” joints wherever. Yes, sympathy is a hard bargain for some of us, but at least YOU have written a few articles — that is a simply brilliant rejoinder!! PS Pleated front pants make everyone look FAT!! Flat front is the way to go — my fashion guru tells me so!! And as a dear friend used to tell us in college “if you’ve got it, flaunt it! !” so I say, fashion is as fashion does, or whatever. That’s my story and I’m sticking to it!! Pleated pants only make one look fat if the pleats are stretched to the point that they appear to be flat fronted. Actually that might work out well. What really takes it over the edge is when the pleats stick out at a 90 degree angle to the body – now THAT is hard to hide. Stretched out a bit is nothing to worry about – and really, fashion aside, a little pleating here and a little elastic there is always a good thing. That’s the rest of my story, and likewise I am sticking to that too!! Too bad they don’t make men’s khakis with a pregnancy panel built in. You absolutely have an excuse for your Rubenesque figure and choose to embrace it (or let The One do so). I’ve seen Joe Bastianich and Jasper White, among others lose huge amounts of weight, which I’m sure makes their doctors happy, but are these foodies happy? I hope so. But what’s important is that you’re enjoying your life & something tells me that you are. Tchim-tchim!! Dearest Martha, yes The One does embrace this Rubenesque frame, but it’s getting harder these days! Definitely enjoying my life–except those times I have to shop for clothes. Ugh.